Sprinter Hima Das immediately after winning silver medal at Asian Games 400m final said she was nervous ahead of the final on Sunday. Hima clocked 50.59 seconds to win the silver, behind pre-race favourite Bahrain’s Salwa Naser who won the gold in a new Games record time of 50.09 seconds, a news agency reported. 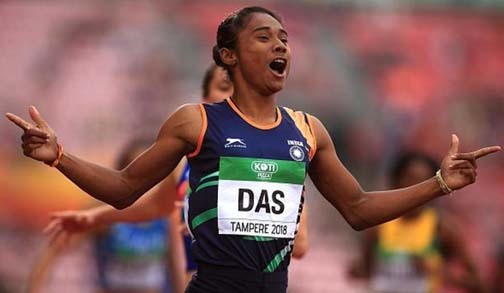 Hima, the reigning Under-20 world champion, had qualified for the final with a national record time of 51.00 seconds on Saturday, bettering the 14- year-old mark set by Manjeet Kaur (51.05) in Chennai in 2004, and she today bettered it again. “You surely get nervous. They don’t see but only I know how nervous I get,” a news agency quoted 18-year-old Hima as saying. “She (Naser) is a big athlete, I am happy to compete with her and I learnt in both the races. I grabbed a bit about race technique bit it’s difficult to explain,” said Hima who finished behind the Bahraini in the preliminary heats also. “They are all good athletes. Good athletes will be there at good competitions but I don’t think about them, I just think of bettering my own time,” said Hima who has developed a habit of bettering her own mark in every subsequent race. “It was tough competition, I knew, I am happy I bettered my mark. I was not confident but knew I will better by some margin,” she said. Hima said she did not plan her final race today. “When you run, you don’t think whether to run first 100m in such time and next 100m in such. There is no time to think. You don’t think who will be ahead or behind, you just run,” she added.